Chips and salsa is one of our FAVORITE snacks around here. 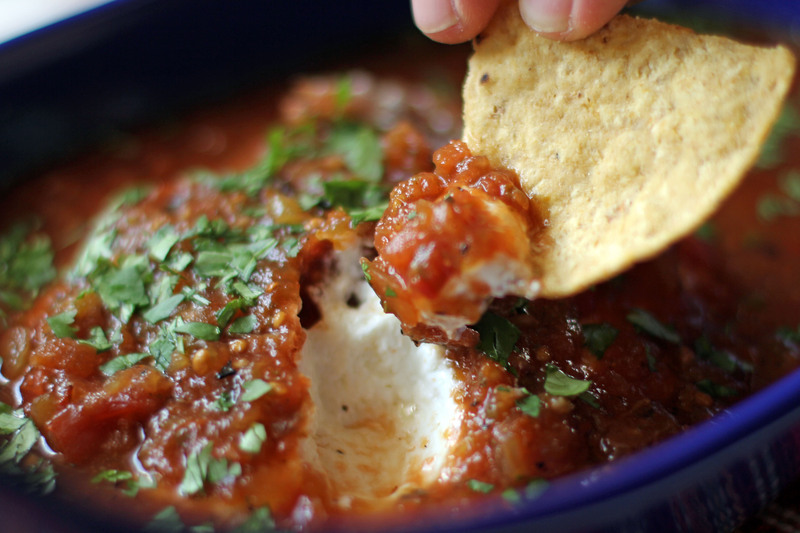 And //this salsa// is one of our favorites. My daughter is so picky. SOOOO picky. SO. PICKY. And I don’t even know how she got that way because her father and I are pretty good eaters. But she does like chips and salsa. If you count, dipping your chip into the salsa and shaking off all the chunky veggies, ‘liking’ chips and salsa. Anyway, that’s one of the reasons she really loves THIS Frontera salsa, because it doesn’t have giant chunks of tomatoes or onions – they are pretty small chunks, and I’m pretty sure she has absent-mindedly accidentally ingested vegetable matter while eating chips with this salsa. 🍴 The recipe calls for pumpkin seeds but I omitted them bc ew, pumpkin. 🍴 The recipe also instructs you to form the mixed cheeses into a disk – next time I make this, I might spread it around the bottom of a baking dish. 2. Mix the cheeses together until well combined and form into a disk. Place into a baking dish and pour the jar of salsa over top. 3. Bake for about 10-15 minutes, or until piping hot. 4. Sprinkle with fresh minced cilantro if desired, and serve with tortilla chips.